The worst thing about dieting is giving up most of your favourite foods and eating basically the same meals every day to keep the calories down. Well, this really need not be the case. I love French Onion Soup, it’s probably my favourite,, but when dieting it is really not on the menu because of the cheese etc. Anyway, this recipe is completely low fat, sadly no cheese, well, strictly speaking, but if you are not being too hard on yourself, grate a small amount on top and pop it under the grill! 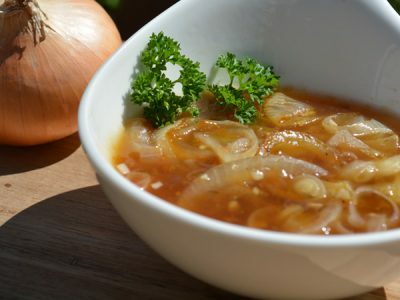 This French Onion Soup is packed with onions and flavour and makes a really good healthy lunch, minus the cheese! Dry fry the onions in pan for about 5-10 minutes, sprinkle with a little salt to help caramelize them, then add in the chopped garlic as you don’t want it to burn then stir in the Stavia or sweetener and cook 10-15 minutes until onions are nicely caramelized. Add the beef broth, bring it to a boil and then simmer for about 20 minutes.